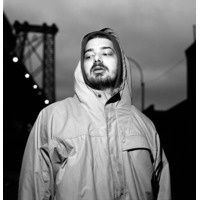 Ian Matthias Bavitz (born June 5, 1976), better known by his stage name Aesop Rock, is an American hip hop artist and producer. He was at the forefront of the new wave of underground and alternative hip hop acts that emerged during the late 1990s and early 2000s. He is signed to El-P's Definitive Jux label and is a current member of The Weathermen. Regarding his name, he said: "I acquired the name Aesop from a movie I had acted in with some friends. It was my character's name and it sort of stuck. The rock part came later just from throwing it in rhymes."